One score and four years ago, a legend departed. A transcendental player whose other-worldly shooting and clutch play made it rain buckets upon the unholy and ushered in an era of Celtic greatness. Bird. Since then, a great void has been left with many admirable Celtics trying to fill what was lost, but to no avail.1 But a new hope lies on the horizon. In what will be the 25th year of waiting, a worthy successor well versed in the church of 50-40-90 and a prime warrior whose skills mirror the great savior himself has emerged. A player ready to claim his spot in history. Durant is the second coming, and with it he shall bring rings and a renewed legacy. Now we can talk details. Before getting into why the Celtics are the unequivocally obvious choice for Durant, a natural question to ask is would Durant even leave OKC? They’ve been consistently good ever since their break-out 09-10 season and have only missed the playoffs once, made it past the 1st round of the playoffs nearly every season, and have even made it all the way to the Finals. You also have Russell Westbrook on your team. So why on earth would he ever leave? Well for one, he’s got a Curry problem. And it’s not just Curry and the Warriors. The Spurs—in classic Spursian fashion—have not only defied all concept of age and the natural decline of great teams after 20 some odd years of excellence (again), they have also found worthy successors in Kawhi Leonard and LaMarcus Aldridge who will keep them a western conference threat for years to come. And despite the Thunder prevailing over the Spurs this year, I can only imagine how many times they’ve thought about the Olympus which is the Western Conference. Year after year, the West has been deeply stacked and though the conference has finally shown signs of dilution2, with a potential dynasty in Golden State (and continued dominance of the Spurs), getting past the 1st and 2nd rounds of the Western conference no will longer remain a good barometer of success, especially for a Durant caliber player where only championships mean anything. Depending on the conclusion of the current showdown with Golden State (series tied at 1-1), we could see the beginning of a LeBron style exit. If OKC gets beaten to a pulp by Golden State in the Conference Finals, it might be enough impetus to get Durant thinking about not only leaving the Thunder, but the Western Conference all together. If Durant were to hypothetically leave, why wouldn’t he look out East? Even though the Eastern conference has become considerably more competitive, it’s not nearly as top heavy as the West with the only true contender being the Cavs. Sure, the Cavs are a force to be reckoned with, but would you rather spend the next 4-5 years of your career playing against a rising Curry (still only 28 years old) who has barely played a full seven seasons or an aging LeBron (31 years old) who has accumulated a grueling 13 seasons of wear and tear? Kevin Durant is currently 27 and his career will completely overlap with Curry’s, so why grind it out with him and the 73 win Warriors in the Western Conference, when you could be on the other side getting your shot at the Finals? That’s assuming the team he joins (*wink) can beat the Cavs, but even then the Eastern conference is still the path of least resistance. He can even take a few games off to rest during the season, a luxury he certainly can’t afford in the West. Before continuing on with my Durant 2016 pitch, I’m sure some readers are already rolling their eyes saying this guy is pulling a huge Mark Cuban, but no I haven’t forgotten about how good Westbrook is, or that playing with such an amazing player is a rare opportunity, or that Westbrook/Ibaka will be hitting free agency in 2017. So let me address that real quick. Westbrook’s free agency next offseason and the cap boom provide another alternative scenario. Durant could sign a one year deal and wait for his superhuman compadre to hit free agency so they could join forces again, but there is one simple argument against this: if they couldn’t get it done together these years in OKC, what would make them think it would work again under a new roof? Durant and Westbrook have been together almost 7 seasons now, and the most they have to show for it is a Finals appearance (even with James Harden!). What’s more, this current iteration of the Thunder is as good as they will get. No help is coming from Free Agency because OKC chose to spend their cap room on Kanter. At this point, OKC’s path to a championship is hoping Dion Waiters turns into James Harden #2, or injuries to the Warriors/Cavs. If they can’t win it all this year, why would Durant expect a different result next year if the team doesn’t improve? It’s hard to imagine the dynamic Westbrook/Durant duo being separated after all these years, but a change of pace might do some good for the both of them. Aiming for two or more superstars on one team has become a league trend post Big Three Celtics, but when it comes to Durant and Westbrook you not only have two superstars, but two MVP caliber players on the same team who both need the ball. Digging a little bit into the numbers, both Durant and Westbrook rank in the top 10 for usage during the regular season, Westbrook being the overall league leader at a 33.3% and Durant at a modest 30.2%, which is a whopping 63.5% of the team’s offensive possessions when they share the floor3. You’d have to look back all the way back to the ’09-10 season to the last time they both haven’t been in the top 104. The only other duo to accomplish this feat was LeBron and D-Wade on the Miami Heat in their first two seasons between 2010-12. But even then their usage never hit Durant’s and Westbrook’s combined. There’s nothing wrong with letting two of the best players in the world control the majority of your offense, but when they’re both so demanding and not necessarily complementary to each other’s game, you end up having two disjointed focal points which reduces your team to ISO heavy ball more often than not. Maybe Scott Brooks didn’t completely deserve the criticism that he relied too much on simple pick and rolls and crunch time give-the-ball to Durant or Westbrook plays. Even under Billy Donovan you see the Thunder relying on old habits with an over reliance on Durant or Westbrook to take turns putting the team on their back. The offense just doesn’t flow when you have two players absorbing most of the touches. Again, seven years and no championship. Maybe this just won’t work. Maybe it’s time for a change of scenery. Maybe where the grass is Greener. Now that I have completely convinced you that Durant should and will leave5 and we’ve narrowed down Durant’s potential suitors to the Eastern half of the country, imagine this opportunity. A dogged young, impressionable, and promising team with a hard-nosed all star orchestrated by a mastermind coach squeezing nearly 50 wins out of a ragtag-supposed-to-be-rebuilding group, managed by a front office wizard. Now imagine that plus a Durantula. No, this is not fiction, this is what the Celtics can bring to the table. Beyond having the cap space needed to sign Durant and flexibility to upgrade other pieces, the Celtics have one thing Durant has not had yet in his NBA career: A great coach. Brad Stevens draws brilliant plays and knows how to get the most from his team on a nightly basis, but one severe cap on that brilliance is that the Celtics simply didn’t have players who can execute offensively on a consistent basis. Watching brick fest 2016 during the Atlanta series highlighted the Celtics desperate need for a knock down shooter and someone other than Isiah Thomas able to create off the dribble. Hmm, that sounds awfully like a job for Kevin, and the beauty of it is that it is that it would be mutually beneficial. Instead of Durant needing to overly rely on ISO-ing, why not take some of the load off his shoulders and run some sweet set pieces to give Durant a couple easy shots. Stevens is the perfectly apt candidate for doing such and with Durant being such a versatile offensive tool it only increases the range of creative play opportunities. It also doesn’t hurt to have a bright young star in Isiah Thomas who would be willing to defer the ball to Durant. Too often we have seen Durant begging for the ball in a crucial stretch, only for Westbrook to go commando and do his own thing. Sometimes it works, often it doesn’t. But look at these Durant numbers without Westbrook – 16 games, 35.9 points, 6.1 rebounds, 6.1 assists, 1.6 steals, 54.9 percent shooting, 43.6 percent from 3PT, and 88.95 percent from the charity stripe. Those are prime Michael Jordan numbers with even better efficiency. Durant has to know what he can accomplish without having to share with Westbrook’s 33% usage; Scoring title every year, MVP talk every year, max endorsements, Curry-level adoration. Yes, Isiah Thomas isn’t as good as Westbrook obviously, but he’s still an all-star, and most importantly, he WILL give Durant the ball. Durant will finally have a team to call his own, not one that he has to share. Okay sounds good, but what does this mean for the Celtics relative to the league? To help illustrate, we can use last season to get an idea of what kind of value Durant might bring to the table. To make it simple6, Durant missed most of last season due to injury which allows us to compare his impact on the Thunder for this season. Looking solely at Offensive Efficiency, last year’s mostly Durant-less Thunder put together a rating of 104.5 ranking 11th in the league. This year they scored 109.9 points per 100 possessions ranking second behind the Golden State Warriors. That’s a 5.4 net gain! Now this isn’t an exact science of course, but let’s say those five or so added points were to be applied to the offensively challenged Celtics. That would bring this year’s Celtics team from 103.9 points per 100 possessions (ranked 13th in the league) to a whopping 109.3 which is good enough for a third place ranking behind OKC and Golden State. Again, it’s not a given that these points will transfer that smoothly, but remember that Durant made that impact even with an MVP worthy season performance from scoring champion Russell Westbrook the previous season. 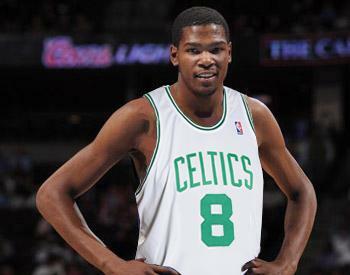 So I’d like to think that he would help a Westbrook-less Celtics team quite a bit on the offensive end. And where Durant can give the Celtics a much needed boost on the offensive of the floor, the Celtics can return the favor by bringing a top 5 defense (Defensive Efficiency of 100.9 opponent points per 100 possessions) to the table as well, an area where OKC has struggled the past couple seasons (sporting a Def. Eff of 103 for a ranking of 12th in the league). Beyond the immediate impact Durant would make on the current team, I can’t stress enough how bright the future is looking out in Bean town. This team has drastically gotten better, going from 25 wins to 48 wins in only 2 seasons, doing so even in the midst of losing Rajon Rondo. That’s no small feat, and given that Danny Ainge has been able to put together this team while hoarding an array of assets—including Brooklyn’s lottery pick this year—gives Ainge some more leverage to work with and help build a Durant centered team. So it all comes down to this. Durant must make a decision this coming 2016, either try yet again with the Thunder or test the waters somewhere else. Durant will most likely sign a one-year deal or two-year with second year player option to take advantage of the 2017 cap boom, but if it’s only one year, why not try something different? Why not scope out the East and see what you could put together and evaluate from there? Legacy takes time to build, but it is also not a purely fixed or linear path. Sometimes you get lucky and you can build upon your success and play successfully somewhere your entire career, sometimes you need to leave and make it happen (Shaq, LeBron, LaMarcus Aldridge). There is no shame in trying to accomplish either, but if Durant does leave, there are plenty of fans in Boston waiting for their next legend, for the second coming. Can’t say I saw it coming, but damn.